In Cambodia, the second great Khmer Empire to arise, after the fall of Funan, was that of Angkor: This ancient Cambodian empire held power from the 9th to the 15th centuries. 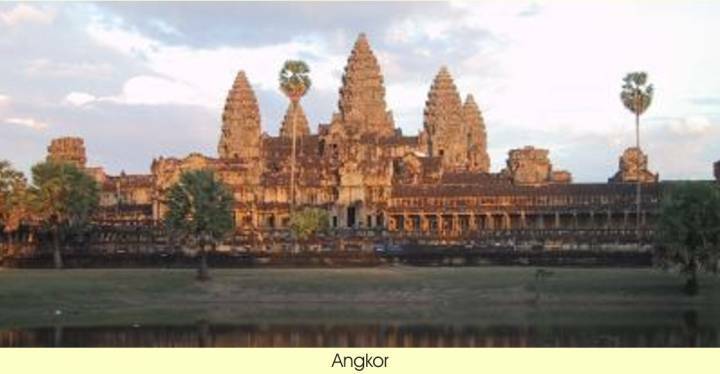 The city of Angkor was located in the modern Cambodian province of Siem Reap, which is in the northwest of the country. "Angkor" itself is a Cambodianized interpretation of the Sanskrit word nagara, which means "city." From the 9th to the 15th centuries, the Khmer kingdom at Angkor was the most powerful and architecturally prodigious culture in Southeast Asia. The Khmers had lived for millennia in this region, and had earlier kingdoms known as Funan and Chenla. These kingdoms were the superpowers of the region in ancient times, but as of late, had been dominated by the new regional superpowers of the time, namely China to the north and Java to the south. 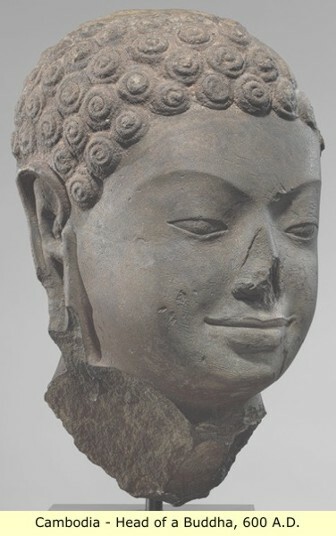 In 802 A.D, a Khmer official in the Javanese court, returned to his homeland, declared himself the new god-king, and took the name Jayavarman II. He then declared full independence from Java. Jayavarman II, thus became the first of many deified kings of Angkor. Angkor reached its "first" peak with the ascension of Suryavarman II in 1112 A.D. Suryavarman II expanded the kingdom into Vietnam and Thailand, and built the famed Shiva temple of Angkor Wat. But the southern Vietnamese state of Champa would not be subjugated. In 1177 A.D, the Chams of Vietnam regrouped, and launched a covert counterattack. They quietly sailed up the great lake of central Cambodia - the Tonle Sap and attacked Angkor. With this attack, the Cham began to take the offensive, and within a few years, the Chams had sacked Angkor and executed its king. But the Khmer were not done, they immediately regrouped for an attempt to take back Angkor. A cousin of the executed king led the charge, and Angkor was retaken around 1180 A.D. 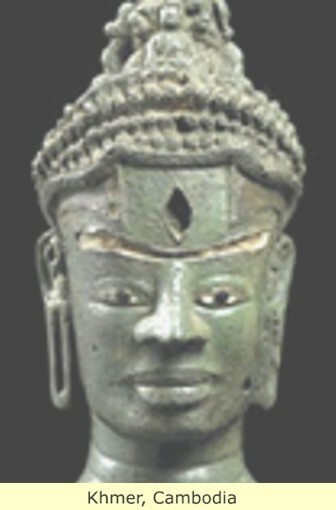 This victorious Prince, was crowned as king Jayavarman VII. For the next four decades, Jayavarman VII would reign over Angkor's greatest period. 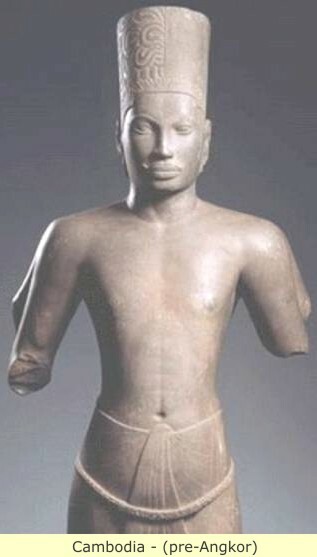 Jayavarman VII's reign was the pinnacle of Khmer culture, but after his death, things began to slip away. By the 15th and 16th centuries, the Thai kingdom of Ayutthaya was in ascendance, and after several unsuccessful attempts at destroying the Khmers, they finally sacked Angkor in 1431 A.D. and then again in 1594 A.D. 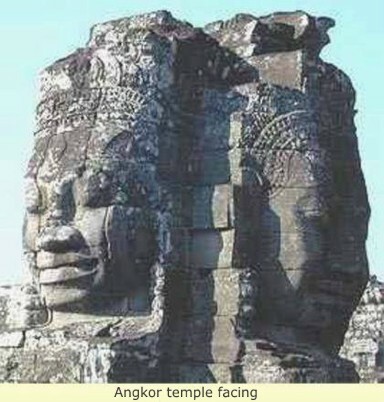 The last sacking forced the Khmer to abandon their capital at Angkor. The Khmer eventually regrouped in a new capital at Phnom Penh, many miles to the south, but the glory period of Khmer history was over. 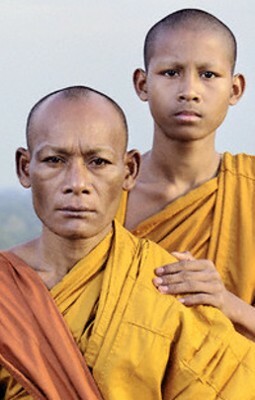 Over time Cambodia was continually subjugated by its now, more powerful Mongol neighbors. As each of them in their turn, gained control of Cambodia, that precipitated the movement of Mongol people into Cambodia. Finally in 1863 A.D, Cambodia became a French territory, by then all had been lost, and the Khmer had been absorbed, producing the current inhabitants.